A constitutional referendum poster reading "Vote yes," Dakar, Senegal, March 20, 2016 (AP photo by Carley Petesch). 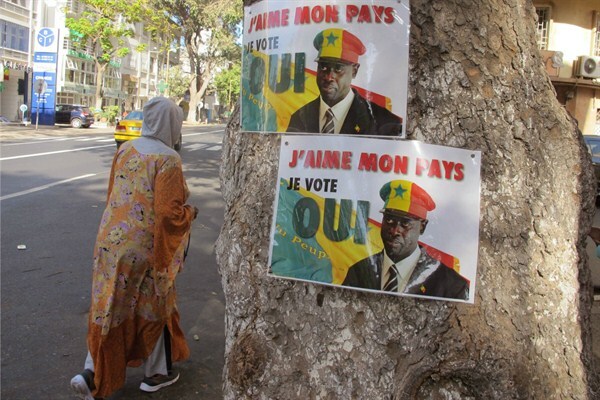 March 20, a day some analysts dubbed “Africa’s Super Sunday,” included a referendum in Senegal on the question of whether to reduce presidential terms from seven to five years. By the next day, both the press and the government were projecting a sweeping victory for the “yes” camp. The divisions surrounding the vote may seem strange at first: President Macky Sall and his supporters favored the reduction, while opposition parties opposed it. Sall emerges from the referendum battle politically strengthened. He can put a nagging controversy behind him, and he positions himself to approach the next election on his own terms.